The iPad supports almost any Bluetooth keyboard, but there are many, many keyboards on the market that are specifically made for use with the iPad. These tend to be designed for portability, and they usually include iOS-specific special-function keys for adjusting volume and screen brightness, controlling media playback, opening iOS’s Spotlight-search screen, going to the Home screen, and more. Some even offer dedicated cut, copy, and paste buttons. Most iPad keyboards are integrated into some sort of protective case, although a good number are stand-alone models. Regardless of the design, most include rechargeable batteries that last for weeks or months on a charge. How do you choose the right one? I’ve tested scores of keyboards, for all iPad models. The result of all that testing is this buying guide, which includes both general shopping advice and specific recommendations. Read on to find the perfect keyboard for you. Before I get into the different types of iPad keyboards, and recommended models, here are a few things to think about when shopping. Always on or removable? If you frequently need a physical keyboard when using your iPad, you’ll appreciate the convenience of a keyboard built into a case, as the keyboard will always be with you. If, however, you use an external keyboard infrequently—or you just like to use the iPad unencumbered for non-typing tasks—you may find a bulky, folio-style keyboard case to be a hassle, as it can be difficult to remove. Keyboard shells, described below, are a nice compromise, and stand-alone keyboards offer the most flexibility. Portability versus usability: With the exception of stand-alone models, iPad keyboards involve usability trade-offs. The thinner the keyboard, the thinner the case, but the worse the feel of the keys. The smaller the keyboard, the more portable it is, but the more crowded the keys are, or the more you’ll find keys that are the wrong size or in the wrong locations. Stand-alone keyboards, on the other hand, tend to be larger, and they aren’t as all-in-one convenient, but they generally offer standard key feel and size, a standard key layout, and a typing experience closer to that of a desktop keyboard. You’ll need to decide which trade-offs you’re willing to make in the name of portability—especially if you’re a touch typist—and check for these trade-offs when shopping. A literal hands-on test is immensely valuable if you can get one; otherwise, be sure the store or website you’re buying from offers a good return policy. iPad keyboards are exercises in compromise. You need to decide which compromises are best for you. These days, you can still find a few keyboard cases for the original iPad, but most are for either the iPad 2/3/4, the iPad Air, or the iPad mini. If you’re shopping for a keyboard case—rather than a stand-alone keyboard that works with any iPad—be sure to get the right one for your iPad. To help you out, I’ve noted in my recommendations which keyboard cases fit which full-size iPads; if you’re looking for a keyboard for the iPad mini, I’ve included a separate section for the mini at the end of this guide. Just your type With all that out of the way, read on for details on the main types of iPad keyboards (and related accessories) available, along with my recommendations for a few of the best in each category. Easily the most common type, these keyboards are integrated into a full-body, folio-style iPad case that protects your iPad all over. The all-in-one design of folio keyboards is convenient, and most make it easy to type on your lap—no desk or table required. In the past, most of these models used a leather (or leather-like) folio case, but more and more are using plastic shells to reduce size and weight. These models, along with keyboard shells (below), also tend to include the thinnest keyboards. Folio keyboards have a few drawbacks that can affect usability and comfort. For starters, the actual keyboards tend to be cramped and have small, poor-quality keys, sometimes using odd layouts. Many also limit the iPad to a single propped-up angle and landscape orientation—even though portrait orientation is often better when you’re typing traditional documents. It can be a hassle to remove the iPad from the case, which means you end up carrying the keyboard when you don’t need it—yet it can also be inconvenient to use your iPad as a tablet while it’s in the case. (On some, you flip the keyboard behind the iPad, making for a tablet-ish, though bulky, package.) My recommended models do have smaller-than-standard keyboards, but they otherwise make solid attempts to avoid these flaws. They also all support the iPad’s magnetic sleep/wake feature. In terms of traditional “looks like a leather folio” keyboard cases, the best ones I’ve seen are Logitech’s $100 Ultrathin Keyboard Folio for iPad Air (iPad Air) and $100 Keyboard Folio for iPad (iPad 2, 3, 4). The keyboards of the two models are essentially identical. The keys have great tactile response, they’re larger than those on most folio keyboards, and they’re spaced normally. Logitech accomplishes this feat by making a few symbol keys on the right—[ ] \ ; and ’—half-width, and by converting the Tab and Caps Lock keys into fn-key-activated overlays of the Q and A keys, respectively. If you use either Tab or Caps Lock frequently, this arrangement may not be for you, but I suspect that most people will be willing to give up one-touch access to these functions in favor of full-size-keyboard feel. You also get the usual array of iOS special-function keys, accessible as fn-key overlays of the top row of numbers and symbols, as well as text-selection keys as overlays of the arrow keys. I have just two minor complaints about the keyboard: The keys are slightly convex, instead of concave, and the aforementioned Tab/Caps Lock trick shifts the entire keyboard slightly to the left, so your hands aren’t centered on the iPad’s screen. But you get used to both oddities fairly quickly. Honorable mentions: Many other models in this category are simply bulky leather or faux-leather folios with a disappointing keyboard tacked onto the inside of the case. However, a few products get my limited recommendation. Belkin’s $129 Qode Ultimate Keyboard Case for iPad Air (iPad Air) and $100 Qode Ultimate Keyboard Case for iPad (iPad 2, 3, 4) are worth a look, especially for non-touch-typists. (The models differ slightly, but they’re basically minor variations on the same product.) First, the bad things: The keyboard is more cramped than those of the recommended models above; Belkin has overlaid the special-function keys with the number keys in the top row (you access the former using the fn key); and a few keys are in non-standard locations that will drive touch-typists crazy. But the keyboard itself is otherwise pretty good; the case offers three different screen angles and a thin, rigid shell that provides good protection; and you can flip the keyboard behind the iPad for traditional tablet use—the keyboard automatically turns off when your iPad isn’t propped up. Best of all, the iPad Air version is just over half an inch thick when closed, and the keyboard and iPad Air together weigh under two pounds. Kensington’s KeyFolio Exact line is worth a recommendation because of the keyboard the KeyFolio Exact models share. Though the keys are a bit small, and they don’t feel quite as nice as those on the recommended models above (for example, I found that I had to press keys a bit more firmly than on those keyboards), the keys offer good tactile feedback, the key layout is standard, and the keyboard is overall nice to touch-type on. You get a dedicated row of iOS special-function keys, and you also get a couple keys for quickly selecting text. My only major complaint about this keyboard is that there’s a raised frame at the front, just below the Spacebar and modifier keys, that’s slightly taller than the keys. At times, I "pressed" this frame when I meant to press a modifier key. Of the KeyFolio Exact offerings, my favorite is the $110 KeyFolio Exact Thin Folio with Keyboard for iPad Air. (The $130 KeyFolio Exact Plus Thin Folio with Keyboard for iPad Air is the same product but with a backlit keyboard.) The overall package is thin, though it’s quite deep, front edge to back: 8.2 inches when closed, and 9.5 inches when open with your iPad propped up. In return for this added depth, you get multiple screen angles and a built-in stylus holder, and you can remove the keyboard itself from the folio for a more-ergonomic typing arrangement. It’s not the most-attractive keyboard folio—for example, there are some flaps of extra material that will surely show wear and tear over time—but it’s versatile. Kensington’s $100 KeyFolio Thin X3 for iPad Air (iPad Air) isn’t part of the Exact line, but it’s still worth a look. Though its keyboard isn’t quite as good as that on the KeyFolio Exact models—the keys are thinner and don’t offer the same tactile feedback—it uses the same standard layout with a dedicated special-function-key row. (It also omits the Exact line’s raised frame, which is a minor improvement.) Like many recent folio-style keyboard cases, the Thin X3 uses a plastic shell for the iPad, rather than a traditional leather cover, and offers a single propped-up angle, but when closed, the entire package is quite thin and light. The Thin X3’s case includes the capability to flip the iPad over the keyboard for tablet-mode use; the keyboard automatically turns off when your iPad isn’t propped up for typing. But what makes the Thin X3 worth including here is that its 1650-mAh battery can be used to charge your phone, at full 1-Amp speed, as long as the X3’s battery has enough juice left. (You use the included USB adapter along with your phone’s own charge/sync cable.) Kensington says that a fully charged Thin X3 battery should give a depleted-battery iPhone 5 or 5s nearly a full charge. It’s a really nice feature that I appreciated more than I expected I would. Latest update: Added Kensington’s KeyFolio Thin X3; updated prices on Kensington KeyFolio Exact models; updated names of Zagg models. Previous update: Added Logitech’s Ultrathin Keyboard Folio for iPad Air, Belkin’s Qode Ultimate Keyboard Case for iPad Air and Kensington’s KeyFolio Exact Thin Folio with Keyboard for iPad Air; updated prices; removed Zagg ZaggFolio for iPad 2 and Logitech Solar Keyboard Folio, which have been discontinued. These models essentially turn your iPad into a laptop: The iPad acts as the laptop screen, while the keyboard and its surrounding enclosure, attached by some sort of hinge, play the role of the laptop base, often complete with palmrests. The downsides to most clamshell keyboard cases are that they tend to add a good amount of weight and bulk to your iPad; they usually make it difficult to use your iPad as a tablet (i.e., sans keyboard) when you’re not typing; and they use smaller-than-normal keys in a cramped layout. But the quality of the keys is often a step up from that of the average folio-case keyboard; the laptop-style design works well for typing on your lap; and most offer a good range of screen angles. Like folio-style models, most clamshells hold the iPad in landscape orientation, though you may find ones that let you prop the tablet up in portrait orientation. The ClamCase Pro’s keyboard itself is one of the best I’ve seen in a keyboard case. It’s a bit cramped, and the modifier keys are on the small side; but all the keys are in the correct place, it’s got a nice array of dedicated special-function keys (including Cut, Copy, and Paste), and there’s little here that will frustrate a touch-typist. The iPad Air version is, of course, smaller, thinner, and lighter (two pounds, four ounces including your iPad, compared to three pounds for the version for the iPad 2/3/4), but both models use the same overall design and an identical keyboard. The only real difference I found is that the iPad Air version’s hinge isn’t quite as stiff as that on the “older” version. Overall, the ClamCase Pro models offer one of the best on-your-lap typing experiences of the iPad keyboard cases I’ve tested. ClamCase’s $149 standard ClamCase—available in black, white, or black-and-white, with specific versions for each iPad generation—is bulkier than the ClamCase Pro, uses an all-plastic case, and has keys that aren’t as good. But it’s still a decent option if you insist on a clamshell model, or if you have an older iPad. Despite the word “folio” in its name, Zagg’s $100 Folio Keyboard Case for Apple iPad Air (formerly called ZaggKeys Folio with Backlit Keyboard) is really a clamshell case, as it uses a rigid iPad back shell connected to the keyboard base by a stiff hinge. But unlike most clamshell cases, the Folio does your iPad Air justice by keeping things thin: The closed Folio is just 0.7 inch thick, and the whole package—iPad Air and Folio—weighs just 2.3 pounds. The Folio’s excellent keyboard, like that on the ProFolio+, above, is easy to type on and offers backlit keys. The overall design makes it easy to use the Folio on your lap; however, the hinge design makes it a challenge to access the iOS Control Center feature, since the bottom edge of the iPad’s screen is so close to the hinge. The shell covering your iPad has nifty channels that redirect your iPad’s audio toward you; and both the top and bottom of the case offer a nice, grippy texture. Like the ClamCase Pro, this one offers a very good on-your-lap experience, though at a much lower price. If you want even less bulk, Zagg’s $100 Cover for Apple iPad Air (formerly called ZaggKeys Cover for iPad Air) is essentially an iPad Air version of the company’s older ZaggKeys Cover for iPad mini. Like the Brydge, below, the Cover for iPad Air forgoes a protective iPad cover or shell in order to give you an extremely thin clamshell-keyboard design. Instead of such a cover, the back edge of the keyboard base hosts a wide, sturdy hinge with a slot for the edge of your iPad Air. Slip your iPad into that slot—it takes a bit of force to insert or remove—and your bare iPad serves as the “laptop” screen and top case, folding flat against the base to cover the screen for transit. The Cover’s keyboard is excellent—it’s the standard model used on all recent Zagg keyboard cases, including the Folio, above—and conveniently backlit. The Cover adds only a quarter of an inch of thickness and under a pound of weight to your iPad, and the hinge is sturdy and adjustable, making this another great lap-typing option. My biggest beef is that the hinge, like the one the Folio, makes it difficult to access iOS’s Control Center. Honorable mentions: Brydge’s Brydge+ with Speakers ($99 for aluminum; $79 for black polycarbonate composite; iPad 2, 3, 4), like Zagg’s Cover, above, uses your iPad as the top of the clamshell. Instead of the Zagg Cover’s single wide hinge, however, the Brydge+’s base sports two narrow-but-still-sturdy hinges. You slip your iPad into these silicone-lined hinges, and they grab the tablet firmly enough that the keyboard won’t detach without some firm tugging. The Brydge+ also includes a pair of tinny-but-decent Bluetooth speakers to give you louder audio. (The company offers an $89 aluminum model that omits the Bluetooth speakers.) The Brydge+ is a well-made and impressively designed accessory—especially the aluminum version—but there’s a caveat for touch-typists: Though the keys are nice to type on, they’re slightly cramped, and the layout wedges the up-arrow key between the right-hand slash (/) and Shift keys. In my testing, I regularly pressed the up-arrow key, thus moving the cursor to the previous line, when I meant to press Shift. I could never get past this odd layout. 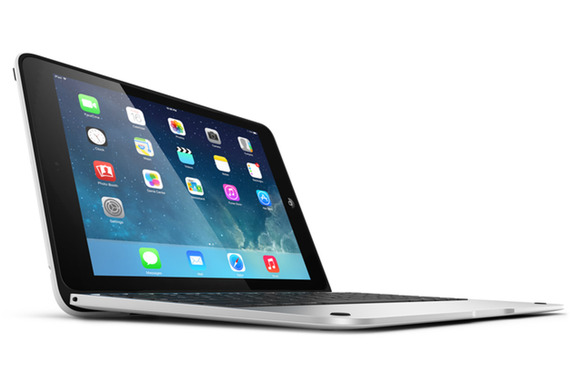 Brydge recently announced the $199 BrydgeAir for iPad Air. I’m awaiting a review unit, and I’ll update this section once I’ve had a chance to test the new model. Latest update: Replaced the original New Trent Airbender with the newer Airbender 1.0, 2.0, and Pro models; updated Zagg product names; updated price and options for Brydge+. Previous update: Added Zagg’s ZaggKeys Folio with Backlit Keyboard for iPad Air and ZaggKeys Cover for iPad Air; updated prices; added info about New Trent’s new models for the iPad Air. These models are the thinnest and lightest of the keyboard cases. They integrate a thin keyboard into a rigid shell that protects the front (screen) of the iPad in transit. When you’re ready to type, you pop the iPad out of, or pull it away from, the shell; stick it in a prop-up slot above the keyboard; and start typing. Most keyboard shells offer only a single angle for your iPad, though they often let you use your iPad in your choice of portrait or landscape orientation. Keyboard shells can be used on your lap if you’re careful, but they’re usually less stable on your lap than folios and clamshells, especially if your iPad is positioned in portrait orientation. Some keyboard shells, but not all, can be used in tandem with Apple’s Smart Cover. As with clamshell-case models, the keyboards here tend to be a bit cramped, and the keys are usually smaller than normal. The models I’ve recommended are nevertheless quite usable, and despite their super-thin profiles, they have keys that feel nice when typing. Recommendations: Logitech’s $100 Ultrathin Keyboard Cover for iPad (iPad 2, 3, 4), $100 Ultrathin Keyboard Cover for iPad Air (iPad Air), and $100 Ultrathin Magnetic Clip-on Keyboard Cover (iPad Air)—all variations on the same design—are personal favorites thanks to a clever design, a thin profile, light weight, very good keys, and a standard key layout that’s the least cramped I’ve found in a keyboard shell. Instead of gripping the edges of your iPad, each Ultrathin Keyboard Cover uses a hinge that attaches magnetically to the edge of the tablet; the keyboard then closes against your iPad’s screen (again, sticking magnetically) to protect the screen during transit. When you’re ready to type, you just flip the keyboard away from the screen, give it a gentle tug to detach the hinge, and then prop your iPad in the slot above the keys. Combine an Ultrathin with a Smart Cover-compatible back shell, and your iPad is completely protected in transit. Though there are many copycat products out there these days, the Logitech models are still the best overall, in my opinion. The original and iPad Air versions of the Ultrathin Keyboard Cover are very similar to each other, though the one for the iPad Air is, of course, a bit smaller. Each uses a hinge that looks like, and functions identically to, the hinge on Apple’s Smart Cover. The Air model includes a few tweaks to its keys compared to the original: It removes the right-hand Command and Option keys in favor of a language key; it gains Previous and Next media-playback keys; it adds special-function keys for Siri and iOS’s multitasking screen; and it loses the Spotlight-search key. A few keys are also narrower than on the original version, but instead of fingerprint-magnet glossy black, the area above the keyboard has a nicer matte finish on the Air version. The very latest model, the Ultrathin Magnetic Clip-on Keyboard Cover, is even thinner, yet it manages to make the actual keys slightly larger, and it even gives you a separate special-function-key row instead of overlaying those functions on the number keys. The newest version’s keys aren’t quite as nice to type on as the ones on the earlier two models, but they’re still very good for this type of keyboard, and their larger size makes up for much of that difference in feel. You also now get a right-hand ctrl key, a dedicated Spotlight-search key, and a dedicated screenshot key. The other big changes are to the hinge and iPad slot. Instead of the Smart Cover-like hinge found on the earlier models, the Magnetic Clip-on Keyboard Cover features a hinge that collapses into the body of the cover when you’re using the keyboard; you extend the hinge by carefully sliding your iPad, flat against the cover, toward the hinge until the iPad’s own magnets cause the hinge to pop up. This new design looks nice, but in practice it’s a bit too fiddly for my tastes. On the other hand, the slot on the new model also features its own stiff hinge, so you can tilt your iPad back as much as 30 additional degrees, allowing for much nicer screen angles when typing (at least when your iPad is in landscape orientation—the additional lean makes a portrait-orientation iPad less stable). This slot hinge is quite sturdy—it takes a good amount of force to change the angle. The only drawback to this feature is that you must remember to manually press the hinged slot back into place before putting your iPad and the cover together for travel. If you have an iPad 2, 3, or 4, it’s easy to decide which Ultrathin to get, as only one of the three models fits those iPads. If you have an iPad Air, you’ll need to make a decision: Ultrathin Keyboard Cover for iPad Air or Ultrathin Magnetic Clip-on Keyboard Cover? Both are very good; each has minor advantages, and each has minor shortcomings. Having used both extensively, I recommend buying whichever one you find for a lower price—unless you’d really value the capability to change the angle of your iPad while typing, in which case you’ll want the Magnetic. Zagg’s $130 Pro Plus (iPad 2, 3, 4; formerly called Zagg KeysPro Plus) uses the same solid keyboard as the company’s ProFolio+, above, but in a keyboard-shell body that clings magnetically to the front of your iPad during transit. You just detach the Pro Plus from your iPad, prop your iPad in the slot above the keys, and type away. A nice bonus feature is that, like the ProFolio+, the Pro Plus’s keyboard uses backlit keys for easier typing in low-light environments. Honorable mentions: Belkin’s $100 Qode Thin Type Keyboard Case for iPad Air (iPad Air) uses a keyboard similar to the one in the Qode Ultimate Keyboard Case for iPad Air (mentioned in the folio section above), which means that while the keys themselves are nicely responsive, the keyboard is a bit cramped, and some keys are in non-standard positions—like its sibling, this isn’t a great option for touch-typists. However, the Thin Type’s keyboard bests its sibling’s thanks to a dedicated special-function-key row and some interesting keys that correspond to the iTunes Radio options to Play More Like This, Never Play This Song, and Add To iTunes Wish List. The Thin Type uses a Smart Cover-like hinge, and it looks fantastic thanks to a unibody anodized-aluminum body—at the thinner front edge, this is the thinnest keyboard shell I’ve seen, though the edges are MacBook Air-sharp. The company says the Thin Type’s battery, which adds a bit of thickness to the back edge, offers 3,100 hours of standby life or 79 hours of active use. A nifty touch is that when you remove your iPad Air from the Thin Type’s slot, the keyboard immediately turns off, so you avoid accidental typing when your iPad isn’t propped up for work. If you aren’t a touch-typist, this is a nice option. Belkin’s $80 Qode FastFit Keyboard Cover (iPad 2, 3, 4) is similar in design to Logitech’s Ultrathin Keyboard Cover, but without the magnetic hinge. Instead, it’s got a magnetic, stationary lip along the back edge that holds the iPad in place during travel. It bests the Ultrathin by offering two grooves for your iPad, so you get a choice of two screen angles. However, the FastFit’s keys are a bit smaller; the square shape of those keys feels a little off; and the FastFit makes the same touch-typist-thwarting mistake with the up-arrow key as the Brydge+, above. If you’re on a budget, Anker’s TC930 Ultra-Thin Bluetooth Keyboard Cover for iPad Air (iPad Air) looks a lot like an iPad Air-sized clone of Logitech’s original Ultrathin Keyboard Cover, though with keys that are a tiny bit smaller and more cramped, and that don’t feel as nice. Also, I had to press those keys a bit more firmly than expected for the key presses to register. The result is a typing experience that isn’t as good as what you’ll get with the other keyboard shells recommended here. But the keys are all in the right locations; you get a proven design; and the TC930 adds a nifty support stand that automatically pops up whenever you prop your iPad Air in the slot above the keyboard, making the iPad a bit more stable than with the original Logitech model. And then there’s the most compelling feature of the TC930: It’s available for just $30 on Amazon.com. Latest update: Added Logitech’s Ultrathin Magnetic Clip-on Keyboard Cover, Belkin’s Qode Thin Type Keyboard Case for iPad Air, and Anker’s TC930 Ultra-Thin Bluetooth Keyboard Cover for iPad Air; updated product names; removed Zagg’s ZaggKeys Pro, which has been discontinued. Previous update: Added Logitech’s Ultrathin Keyboard Cover for iPad Air. Instead of a physical keyboard, several companies offer overlays that lie on your iPad’s screen—generally secured using magnets or some kind of sticky silicone–and add a tactile feel to the iPad’s own software keyboard. For example, Touchfire’s Touchfire Keyboard for iPad (iPad 1, 2, 3, 4; Air version announced; $40 and up) is a clear, silicone overlay that adds little nibs to each virtual key’s “top,” as well as slighty raised ridges around each key. The Touchfire does make typing a bit more tactile for touch-typists, but the overall experience isn’t otherwise much different than typing on the bare screen. And I found that because of the tactile feel, I frequently rested my fingers on the Touchfire’s key areas, which resulted in accidental key taps. The $35 TacType (formerly called the iKeyboard; iPad 2, 3, 4) instead uses a rigid-plastic frame with clear, bubble-like key overlays. This approach prevents accidental keypresses, and I liked typing with it better than with the Touchfire, but I found the bubbles to be too difficult to press compared to good physical keys. Keyboard overlays can be convenient—they take up quite a bit less space than a full keyboard, and they don’t require batteries or charging—but I personally don’t find them to be enough of an improvement over the iPad’s on-screen keyboard to make them worth the cost. And, of course, you must move them out of the way whenever you want to use the iPad’s screen normally. Continue to the next page for stand-alone keyboards, desktop/tablet hybrid keyboards, stands and cases for keyboards, and iPad mini keyboards.